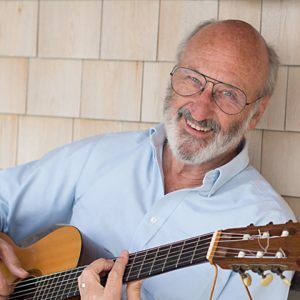 Singer/songwriter Noel Paul Stookey has been altering the musical and ethical landscape of this country and of the world for decades, both as ‘Paul’ of the legendary trio Peter Paul and Mary, and as an independent musician who believes passionately in bringing the spiritual element into the practice of daily life. Funny, irreverently reverent, thoughtful, compassionate – Stookey’s vocal sound is known across this land, from the iconic “Wedding Song” to “In These Times”. While acknowledging his history and the meaningful association with Peter and Mary (performing occasionally with Peter as a duo following the passing of their partner Mary Travers in September of 2009), Noel Paul has stepped beyond the nostalgia of the folk era. Whether judged by the subject matter of his current concert and recorded repertoire or by virtue of his active involvement with Music2Life, an organization co-founded with his daughter, creating music-based programs, events and promotions to move hearts and minds around a particular effort or cause, Stookey’s current musical outlook continues to be fresh, optimistic and encouraging.